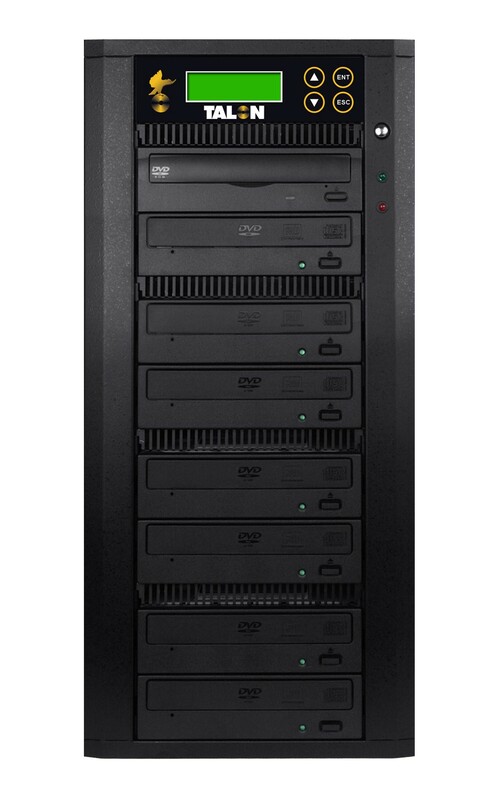 The TALON DVD-R and R/RW Tower Duplication Systems are full featured, reliable and economical duplicators utilizing new combo Pioneer DVD-R or DVD+R drive technology that also include support for CD-R. Now users can take advantage of the usability of the DVD format and the low cost of the CD-R format in one tower system configuration. Discs created with the TALON DVD +R/RW systems can be played back in virtually any set top player or any DVD ROM reader in a PC or laptop device. In addition, the DVD +R/RWs menu commands include editing and track extraction functions that allow for the creation of compilation discs, and verify data written to duplicated DVD +RW or CD R discs. Call today for more details! DVD drives burn up to 20X DVD and 40X CD Menu Commands Customizable hard drive partition tilting. Copying Simulation Two password protection modes to prevent unauthorized usage. Audio track editing. Customizable, intuitive user-friendly LCD panel. DHP "Dynamic" hard drive partition technology Ability to load disc image to HDD and rename the partition. Support Counter Function Master Error Proof Supports CD-R, CD-RW, DVD +/-R, DVD-RW, Dual Layer Duplicates 110+ 4.7g DVDs or 330+ 650MB CDs per hour with an 11 target system. Includes 64MB buffer memory for 11 target systems and 32MB for 3 target systems. Auto Start Strategy Auto Source Disc Analyzing Select Source Rigorously tested for performance & reliability.